Weekend fun!!! Since our first week at Lake Mead was fairly anti-climatic, we decided to get out and find some adventure over the weekend. First up – a bike ride on the historic railroad tunnels trail. The ~5 mile roundtrip trail travels along an old railroad route that dates back to the 1930s. This track was used for several years during the construction of the Hoover Dam for hauling equipment and supplies. 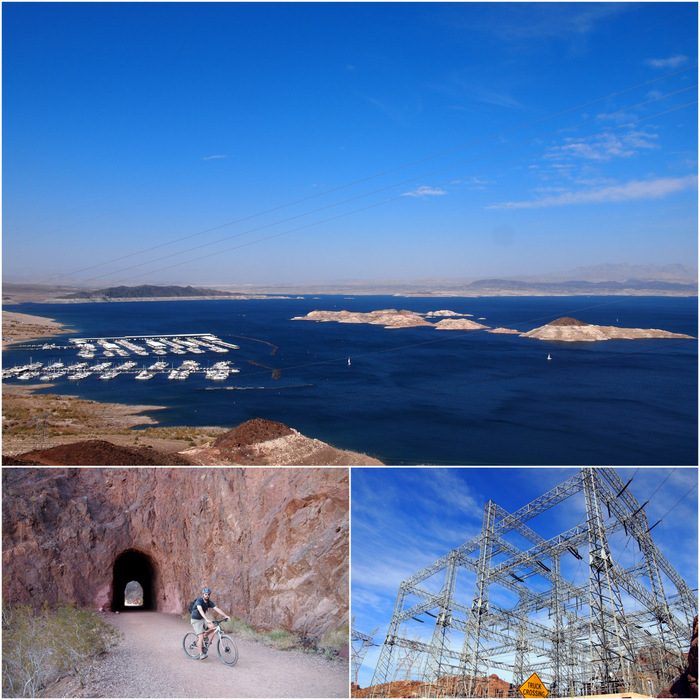 Today the route has become a very popular hiking/biking trail that offers up stunning views of Lake Mead. Besides the lake views, the main attraction of the trail are five large railroad tunnels carved into the cliffs. It was a great trail for biking with a hard packed, smooth surface that was wide enough for walkers and bikers to share. Good thing because on this sunny, blue-sky filled day, lots of people were out walking, running and biking on the trail. 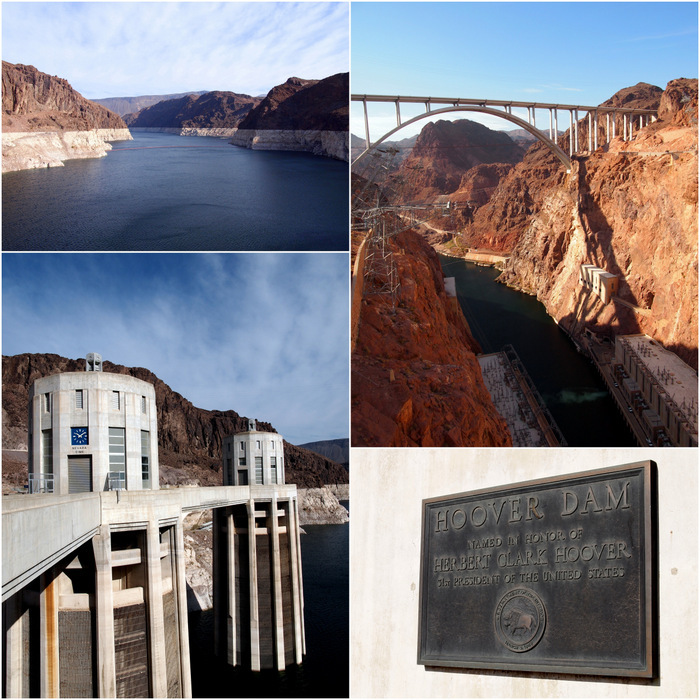 After passing through the fifth tunnel we came to the end of the railroad trail and continued past a highway maintenance yard, a huge grid of power lines, and then down into the canyon towards the Hoover Dam. The trail ends at the top of the parking garage where we had to park our bikes and walk the rest of the way to the dam. 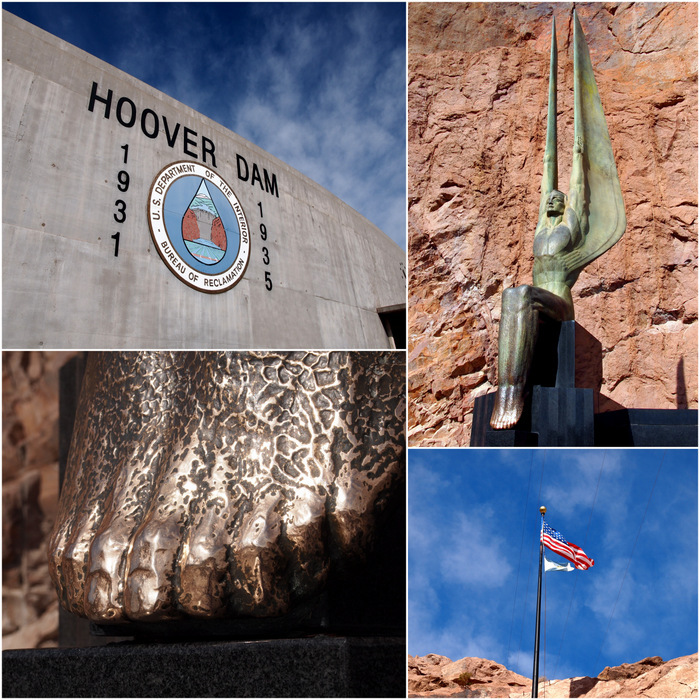 The Hoover Dam is a major tourist attraction. People love a big ole’ slab of concrete holding back tons of water, and they swarm to see this man made marvel in person. They also apparently are willing to shell out 30 bucks a person for a tour of the dam. And 10 bucks a person just to go in the visitor center! Needless to say, we satisfied ourselves with a self-guided tour of the top of the dam. Those shiny toes belong one of the Figures of the Republic who reside at the dam. Legend has it rubbing the toes brings good luck. Next up was some night time fun. Since we spent a few days on the strip last year, we had no need to tour that part of Vegas again. Instead, we found a few less traditional ways to enjoy the Vegas night scene. 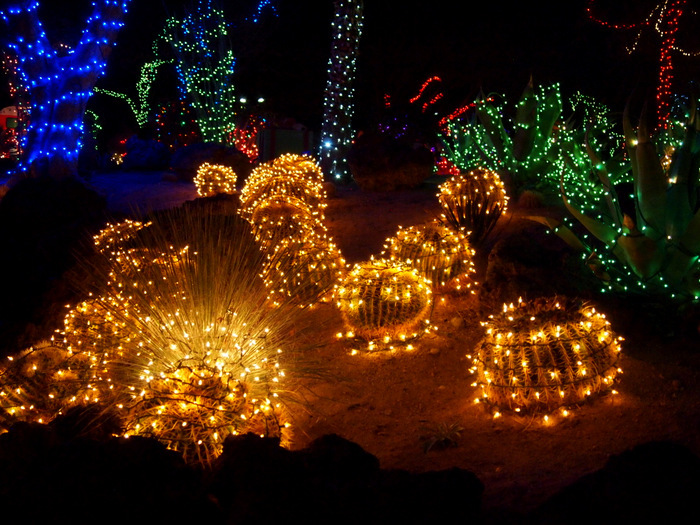 Like this cactus garden all lit up for the season! This stunning display of unique holiday cheer can be found at Ethel M Chocolates. 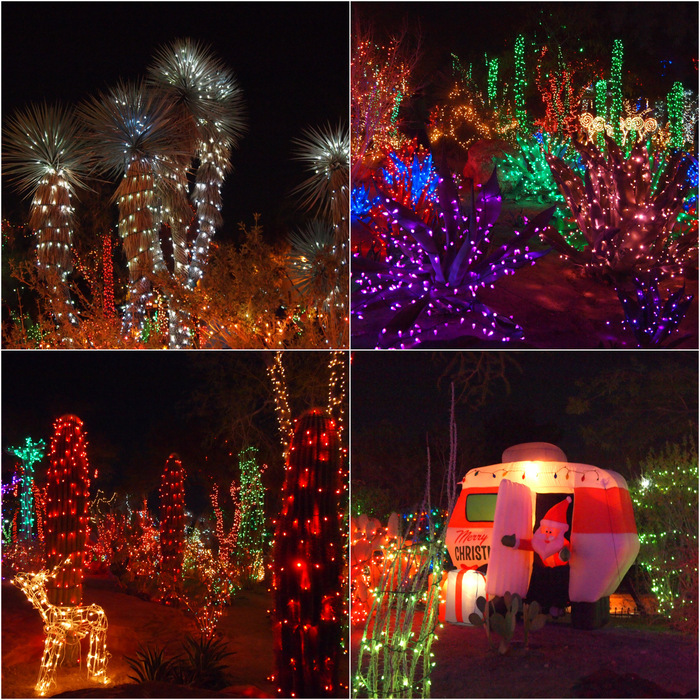 This large cactus botanical garden features over 300 species of desert plants. I would love to visit during the day because from what I could see in the dark it was a pretty impressive garden. This time of year it’s more about the light show than the plants though. Everyday from mid-November until Christmas they light up the garden in the evening and allow people to roam around and enjoy the view. 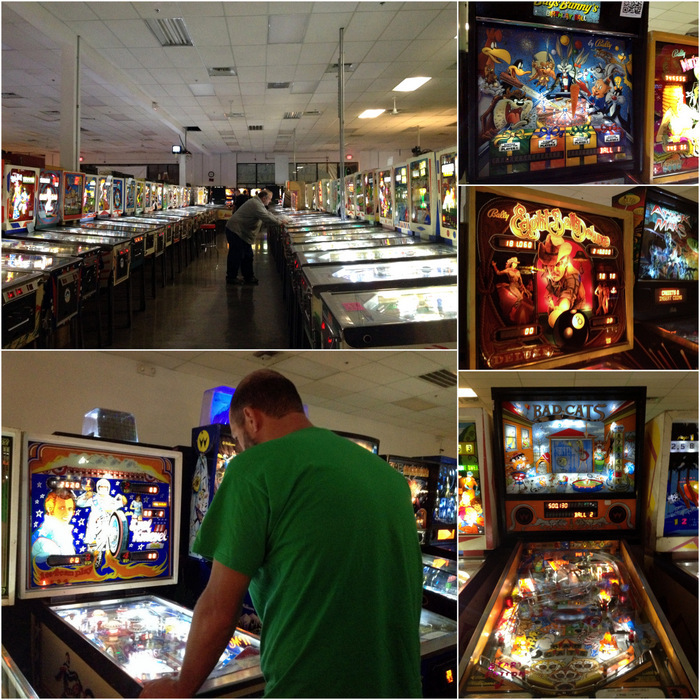 Our second non-traditional Vegas adventure was a few quality hours spent at the Pinball Hall of Fame. The PHoF is a unique museum of sorts housed in a nondescript building with an unassuming, very unVegas-like exterior. No glitz, no glamor, just a large square building filled with FUN! Once inside we discovered row upon row of Pinball machines. The games are mostly older with the oldest dating back to the 1950s, and the newest from the 90s. All the machines are restored by the dedicated staff and kept in good working order. For a mere 25 cents you can play any of the older games, or for 50 cents the games from the 90s. The most impressive part? All of the money collected from the games is donated to charity. We are not pinball aficionados by any means, but we had a blast trying out as many machines as our $13 in quarters would allow. Well that was our Saturday. Lots of adventure and new experiences. Sunday, on the other hand, was the complete opposite. We could say were being lazy…or we could just say it was a day rest and relaxation. 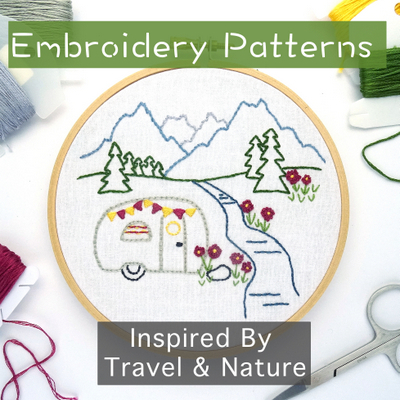 For most of the day we stuck around the house, watching a little football (Tim), working on an embroidery project(Amanda), swimming in the lake (Phineas). In the afternoon we did get our for a walk around the “neighborhood”. I don’t think I’ve mentioned yet how amazing the weather is here at the lake. So I am going to say it now. The weather here is perfect! Everyday the temps are in the 70s, the sky is blue, and the sun is bright. Pretty perfect for November wouldn’t you say? 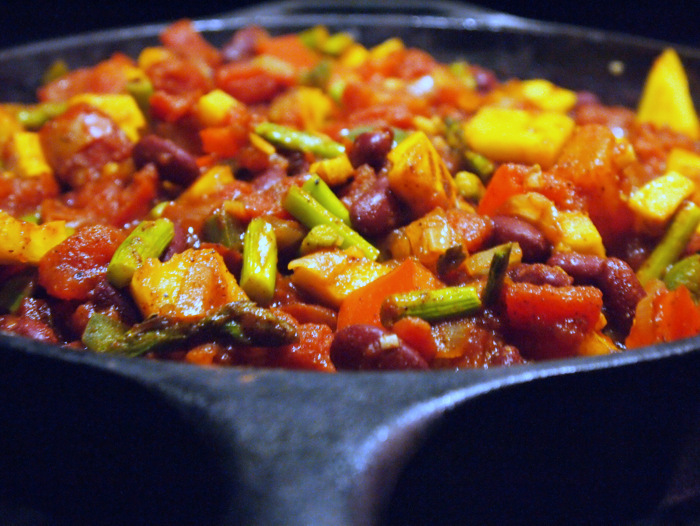 The weekend ended with a big pot of homemade Roasted Vegetable Chili. I ended up throwing together a medley of veggies that had been collecting in the fridge. The result was fantastic. So fantastic in fact, that I am going to share the recipe here with you. It’s been a while since I shared a recipe. Trust me when I say this is a good one. Place the squash, both peppers, and asparagus or green beans on a rimmed baking sheet. Toss the veggies with one tablespoon olive oil. Roast until tender, 20-25 minutes, stirring at least once. While the veggies are roasting, heat the reaming 1/2 tablespoon olive oil in a large skillet or dutch oven. Saute the onion a few minutes until translucent. Add the garlic and cook for 30 seconds more. Add the tomatoes and drained beans. Add all the spices and stir to combine. *You may want to hold off on adding the cayenne pepper until the roasted jalapeño is in the mix so you know how spicy it is. When the veggies are done roasting add them to the chili and turn the heat down to low. Adjust the spices as needed. Simmer for at least 20 minutes for optimal flavor. 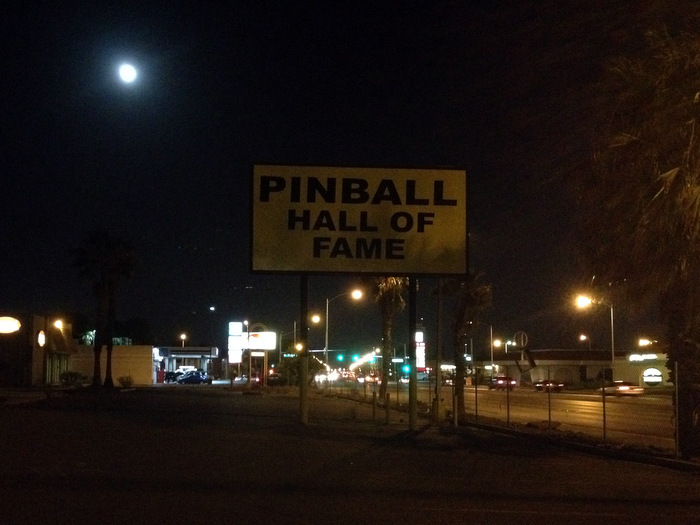 Dang…we missed the pinball museum. Next time! The cacti and gardens at the Ethyl M Chocolates are really pretty. We spent some time there last year. 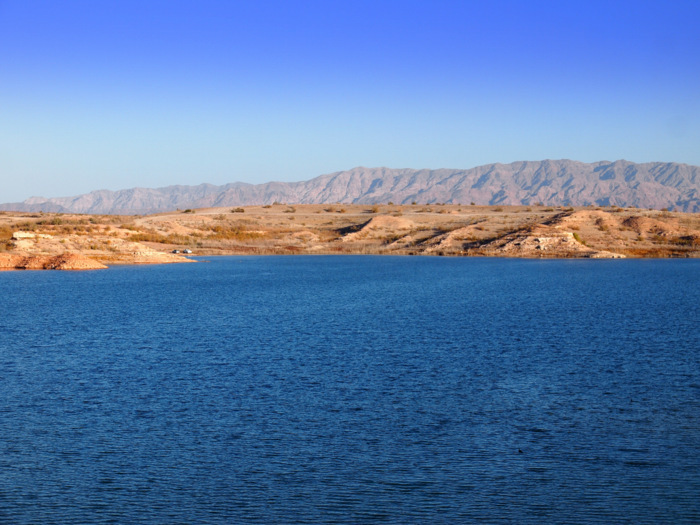 Lake Mead is a beautiful! The Pinball Hall of Fame is a must visit! I was up there on Friday to paddle the Black Canyon below Hoover Dam. Highly recommend! There is a trail into Goldstrike Canyon on the Nevada side as well as the trail into Arizona Hot Springs on the Arizona side that will let you access a couple of the area hot springs from the road instead of from the river. Thanks for the tips! We have been talking about a hike to the hot springs this weekend after our third member of the Airstream gathering arrives. 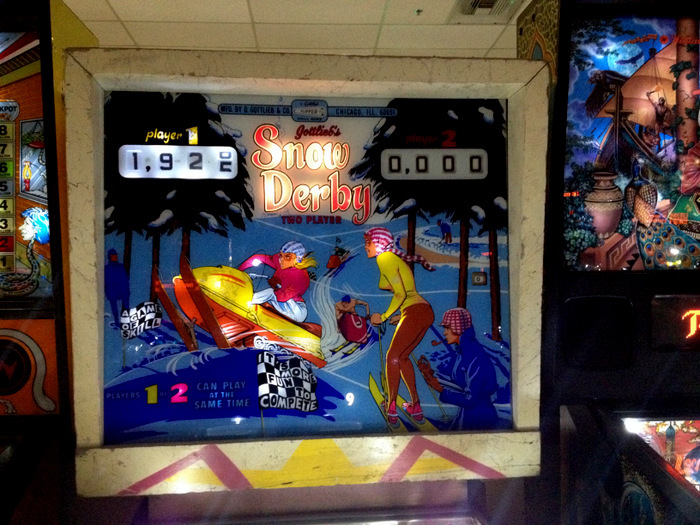 I love the retro image on the snow derby pinball machine! Looks like it was a fun place. Me too! The older games all had very cool graphics. And admission is FREE. Schedule: Daily, June 24 to August 31. Guided tours at 9:30 a.m., 11:30 a.m., 1:30 p.m. and 3:30 p.m. Open the rest of the year for groups of 15 or more upon reservation. English tours available upon reservation. Average length of visit: 2 hours. Thanks for the tip! 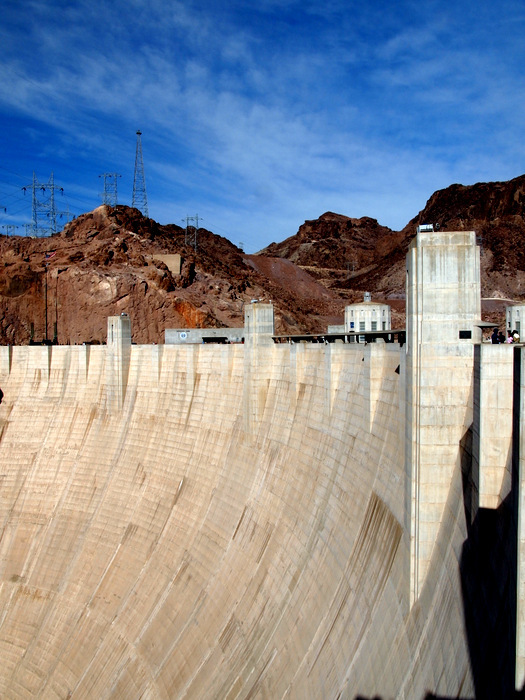 We’ll be back to the east in a few years and will definitely put a trip to this dam on our list of places to go! Met Brian and Leigh today. Still hope to catch up with you guys one of these days. So sad to hear about Phineas.